More Vectr. This time a bit noisier. Basic patch is x controlling VCO1 and Y controlling VCO 2, but this time i have both VCOs going into a VCA where the volume level is controlled by Z (or proximity to the screen) So I can fade in sounds by moving hand closer or further away. The cool thing is that when you record, the Z is recorded too. Z is a bit different to the other axis because it has a slow fade down, so it can be used as a manual ADSR. Here I am demonstrating the time quantising on the Vectr. Recorded live on the night of the Summer Solstice. Not that I care two hoots about that. Roland D2 (drums) sending midi to Futurelabs Mobius, which is sending clock to Mutable Instruments Grids. 2 channels are sending triggers to a Frequency Central SystemX ADSR and a Frac rack Paia ADSR. A Doepfer A110 VCO and a Blacet F350 Morphing terranium have their pitch affected by the X and Y outs from Vectr, which is synched via its REC in socket to a Deopfer Clock Divider, which is receiving clock from Mobius. The out from the A110 is going thru a Frequency Central Raging Bull Filter/VCA, which is modulated by the aforementioned SysX ADSR. That out is sent to desk. The F350 out is going through the PAIA ADSR and sent to desk. One more thing, the Morph X input of the F350 is receiving stepped voltages from the very wonderful Blacet Binary Zone, that is also clocked from Mobius. The backers of Antagonist Games received a demo of the start of their Kickstarter, Through the Woods this week. To the game itself. The voiceover, being a post story interview with a Psychiatrist, was pure genius! And for a change the voice acting wasn’t bad. The recording was well done with the Shrinks voice being a little “off mike”. The accent of the Mother was also quite spot on, as Norwegians speaking English often get this really weird tinge of American to their voice, but IM pretty sure she WAS norsk. It starts slow, which I like and the sound effects are good, I wish they were louder to be honest, the voice comes in so loud in comparison. Also, its NOT that quiet in the woods, and silence doesnt seem scary to me, its calming.. a more dense and compressed sound picture would have been better IMHO. The modelling was pretty generic… The houses felt similar to some asset store packs I have and IM not sure but they definitely used the same environment packs as me , I obviously have no problem with doing that, but it did make it look very similar to mine in places. The terrain texturing was very poor however, although this might have been as a result of my low low settings… but I spent alot of time tweaking (without knowing what the hell I was doing) the terrain shader, to use normal maps and that helped alot. There were also terrible bush billboards, which rotated to face me while I was very close, again, probably my settings, but lavender? Never seen lavender in a Norwegian Wood. The atmosphere built quite nicely, and I had no problem with the door open fails, Im sure I would have enjoyed exploring more if it wasn’t for the frame rate. I lost my way a couple of times and found myself going back down the path the wrong way, an audible hint might have been fun here… its a very linear game after all, so a variable trigger with a voiceover.. ” I retraced my steps a little to see if I had missed something” would have been possible, but too many of them would get generic, maybe? The moment when the door shut behind you and she screamed, well the scream was a bit too much at that stage… I would have preferred a muttered “oh my god”. But then the (Spoiler Alert) Troll attack. funnily enough on my first play through it worked fantastically… For some reason, the growling and a clear path encouraged me to run, so without even getting a glimpse of the troll I ran into the cave, stopped, turned around, and jumped out of my skin as the Troll was there and dropped a stone on the entrance. FANTASTIC!!! What a brilliant thing… I didn’t get a too good look too early (Amnesia keeps you from seeing the monster for ages, soon as you do, funs over) and it was a jump scare, but now I could only go on… but I didn’t…heh heh… being a geek, I quit and started again… but unfortunately the next time I got to that bit of the wood I hung a round looking for the Troll… and there it was lumbering towards me, and thwack.. dead… spawn. Meh… was more fun the previous time… But how could they have done that? Force MY first experience? Easy!…well simply NOT spawned the Troll till I was in the cave, forced me so stop.. fall over for example, look around, Troll feet, Rock BLAM darkness… eyes adjust to cave… torch on again… LEVEL TWO.. but seeing the troll so clearly was less scary and more… “ok here comes the game”. 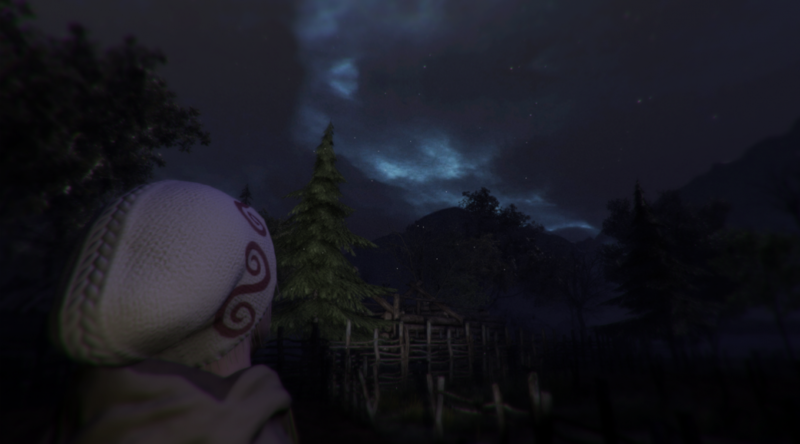 On the whole was was quite impressed with my own game, TRUTH looks better, plays better, and will have much more things to do, but is lacking the strong normal “story” that Through the Woods has, very strong, very usable and makes me very keen to play the rest. Of course my game is a totally different thing with my proposed multi player storywriting feature, and less obvious, but weirder locations. But this is just the start scene, an I have a good feeling that Through the Woods is going to be a great game!